I have a fab guest post from the author today too! I’m going to pop that here at the start and you can read on for my review after! Boy oh boy. If ever anyone asks, ‘What exactly is a psychological thriller?’ just hand them this book, turn on all the lights in their house and leave them to it. It is, for me, the definition of the term. The story is told in two timelines, following the main character Catherine as, first, she meets and falls in love with Lee and, second, battles through her days with OCD after finally escaping what turned out to be a horrifically abusive, manipulative man – she hopes. This book is genuinely frightening, with a couple of reverse-Sleeping With the Enemy moments (you know, when Julia Roberts opens the kitchen cabinets and finds all the tins facing out the right way?) that will make you physically shudder. I read it at home alone, and it had me double-checking that my doors were locked. It’s a master-class in psychological suspense. Big twists are my thing, and this book has a mind-melting whopper of one. I have read in some reviews that people felt it was unbelievable and/or figured it out mid-way through, but I have to politely disagree. Although I had my suspicions, the moment when the killer is revealed just floored me. I can still remember where I was: half-sitting, half-lying on my bed, and I had to put the book down with the shock. Then I went and found the first person I could – my unsuspecting brother, downstairs in the kitchen – and told him the whole plot of it just so I could explain to him how amazing its twist was. Things I love: American pop culture, bookstores, dark humour in my crime, new authors to love. You by Caroline Kepnes comes with all of these. The story is told from the perspective of Joe, our… Well, obsessive, potentially psychopathic stalker. (Don’t worry, you’ll be on his side in no time.) Everything about this book – the voice, the perspective, the story – feels fresh and original in a sea of poor Gone Girl impersonations and unlikeable narrators. Joe is the loveable narrator you really shouldn’t even like. I absolutely loved him—I mean, ahem, this book. He also appears in Kepnes’ follow-up, Hidden Bodies. In the twisty thrillers landscape, this surely is the original and best. Coben has pulled off more than a few earth-shattering twists since, but now we expect nothing less from him. Back in 2001, this came as a massive shock and total surprise. I’ve read interviews with Coben where he says he figures out his plots as he goes along and if that’s true, we need to start studying his brain or sequencing his genome or something, because he can’t be one of us. Can he? How is he doing this?! I don’t know, but I know I don’t want him to stop. A master of the genre. I started Distress Signals last week, and within the first 13 pages I was grabbed hook, line and sinker (see what I did there 😉 ). This book was just brilliant! Once I started reading, I didn’t want to stop!!! I loved everything about it to be honest. The writing style makes the book easy to read, and the story flows well. Distress Signals is about Adam and Sarah, who are living happily together, with Sarah working while Adam is working on his script for his agent. Sarah is to go to Barcelona for a conference and doesn’t return, and when Adam gets her passport in the post with a note attached he thinks something has happened. What ensues is a chaotic search for Sarah. This in turn raises more questions about what was really going on in their relationship. It leads Adam far from home and into danger. I loved this book as it switched between present and past, but the reader didn’t know where the past was going to figure in the book. I have to be honest, the glimpses into the past made me feel really uncomfortable reading them. The subject matter is rather sensitive at times I think! However, once everything was pieced together, i almost felt like banging my head for not realising!!!! 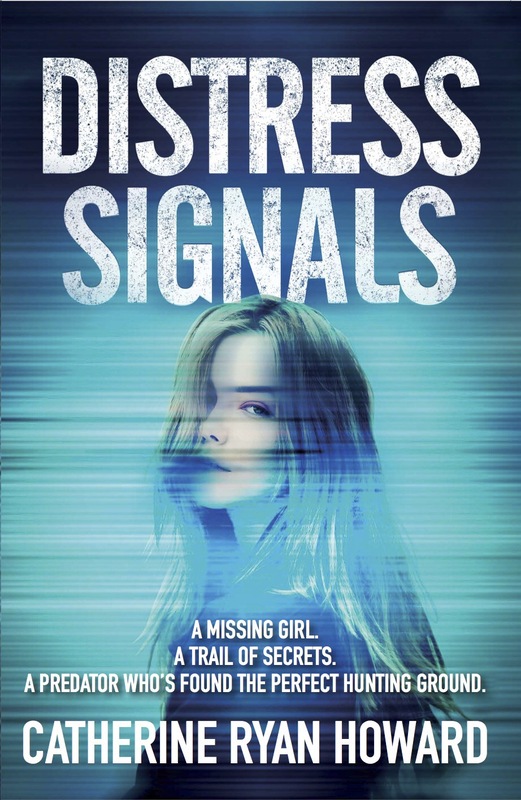 Catherine Ryan Howard has written a great novel in Distress Signals. It is a tense, fast read with a really great story. I gave this book 5 stars on Goodreads! It’s published TODAY and you can order a copy by clicking on the link below!